After what can only be described as a very pleasant evening, we will leave it at that. We awake later than we had expected and feeling a little worse for wear, well me anyway, bloody hubby starting to really annoy me now, nothing no headache, no dry mouth just full of bloody joy, grr! We have our morning fry up, minus the black pudding and get ready for our day out at Cadbury World. Time to jump in the car again, approx. 20 minutes’ drive to Bournville the site of Cadbury World, everyone is looking forward to the day. We arrive park up and make our way to the attraction. It’s a short walk to the rear entrance here we found a large play area and their 4D experience. Also, the entrance to the history of the Cadbury brothers and what they did for Birmingham. We pass this to get to the main entrance. You have to book in advance to get in and we had booked and paid for our slot at 2:40, the time was around midday. So, we decided we will go back round to the play area where there is a beverage outlet, selling tea coffee etc. this is where the first of the disappointment’s start. Myself and Mrs T go to the hatch, only to be told by a very mardy assistant, you can only have speciality tea or filter coffee as the machine is broken and we can’t make hot chocolate. We relay the message to the others and we all decide on coffee, back we go, sorry you can’t have tea or coffee I don’t have any cups, is the reply. We are asked to take a seat as cups are on their way and he will call us when they arrive. So, we dewily sit down, only to turn around a few minutes later to see a massive queue and people being served hot beverages. Ah! Guess the cups have arrived, we queue up to get our filter coffee, only we don’t get filter coffee we get instant coffee at filter coffee prices, which to be frank, was bloody horrible. The time now is around 1pm, so we decide to go on their 4D experience. We walk around the corner only to be greeted by a queue with a approx time of waiting being at 40 minutes. Not knowing how long the experience will be we decided we will not have enough time to do, so we will come back after the main experience. We are now getting cold, so decide to go in to the main building and have a look around. Well basically its spend all your money in the shop or send all your money in the restaurant. So, after a quick look around the shop, which is absolutely packed, we decide to get some food. This was the only decent thing about the day. It was now time to queue up for main experience, when we booked we were advised to be there at least 10 minutes before entry. We were booked to go in at 2:40pm so, we got to the main foyer at just before 2.30pm, as instructed only to be greeted with a huge amount of people, all waiting for their turn to enter. A member of staff is calling all the people for the 2.30 slot, we are then asked to start making another queue for the 2.40 slot. Well there was barely enough room to move let alone make a queue, but we managed. Our time slot has now passed and we are still waiting, it’s now approaching 3pm and they are still calling for people for the 2.30 slot. we are starting to lose the will to live, the kids are getting bored, bored! We are at Cadbury World surly they should be a happy as a pig is the proverbially, but no they just want to go home. The hubby is also starting to lose his patience, as all we can see is people coming through the doors and straight through to the experience. And we are all standing there like dummies’. So, he decides to ask the lovely member of staff what’s going on, her reply was just amazing, it’s really busy sir we have a lot of schools coming in today, and we didn’t know that half the country where on half term. Well surely, they should, being one of the largest attractions in the country they should make it their business to know. A lady standing behind us, said when she booked, Cadbury’s sites said there was only 350 places available for that time slot. so, let’s do the maths. Let’s say that they open a 9 am and the last tour is 5pm, the tours are every 10 minutes, that’s 5 per hours, they are open for 8 hours so that’s 8 x 5 = 40 tours per day. Each tour has up to 350 people, so that’s potentially 40 x 350 = 14000 people per day. 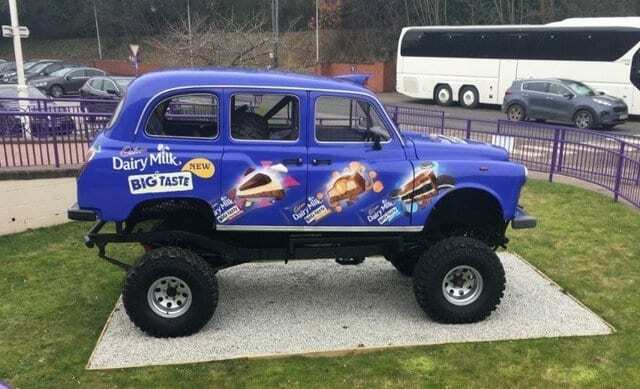 Maybe Cadbury should have done the maths and they would know what to expect and make provisions for it. Anyway, we finally got it to the experience at around 3:10 pm, it started out with a display of how the Mayan’s had discovered the coco bean, then on to displays and shows about how Cadbury had made their chocolate. You then go into the actual factory, the bit we were all waiting for, seeing how they make the chocolate into their famous bars. Well what an experience! We walked and walked along endless corridors looking at nothing. We went up several flights of stairs in anticipation, with the promise of seeing the machines they use in actions, showing us how it’s poured, shaped, filled and wrapped. Instead once reaching the top floor, we saw a room with machines that had been half dismantled. A sign on the wall told us that they had closed this exhibit, as it was being moved to a different site, but nothing about it being replaced with something else. We finally get to the tempering room. Here we had 6 members of staff, 3 giving out melted chocolate with sprinkles on. One melting chocolate and filling moulds with the said chocolate, who had just done a show and was waiting for the chocolate to firm up, so he could do it again, so we couldn’t see that happening. Then there was a lady behind some glass, she was decorating by hand, chocolate teapots and shoes, for the shop downstairs. This was probably the most interesting part. And lastly there was a young lady filling Easter egg moulds with chocolate and putting them on a machine that spins them around to cover the inside of the moulds. We stayed in this area for approx. 10 minutes. Back down all the stairs again to where we started and here we found a queue! Being British we decide to join it, not really knowing what it was for, 30 minutes later we get to the end of the queue to find out it’s a fairground ride, and possibly the lamest ride I have every been on. This was advertised as new, we jump in a car which is attached to a rail on the ground. This then takes you round at the slowest speed possible to look at coco beans is various scenes. We are reminded all the way round to smile at the camera, you know like when you go on a roller-coaster they take a picture of you all dishevelled at the end, smiling and laughing. Well we got to the camera and not one of us had the were with all to smile. This concluded the end of the experience, totally deflated and just wanting to go home and have a coffee, we exit the building. However, one of our party had decided that it just wasn’t on, and went back in to complain. She got absolutely nowhere with them, they did not give a toss. Now you may remember we didn’t do the 4D experience at the beginning as we didn’t think we would have time, and that we were going to do it after. It had taken so long for us to do the tour, that the 4D experience had closed. The member of staff behind the desk radioed down and managed to get the staff to keep it open so we could go and see it. A short walk to the back of the building to were the 4D experience was, we went straight in. It turned out to be around 10 minutes long and was basically a film with the characters from the Cadbury adverts, going on a journey in a roller-coaster ride. You get tossed about a bit in a seat and some air blown in your face, whilst wearing 3D Glasses. Finally, we can go home, totally deflated, after we were all looking forward to what was supposed to be a very enjoyable day. if you ever decided to go to Birmingham, I would not recommend Cadbury World.